I just got out of jail a few hours ago. I was one of 300 people arrested Thursday in Occupy Wall St. protests across the United States. 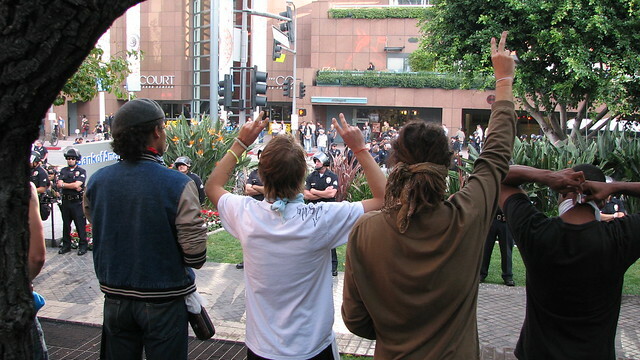 In Los Angeles, a total of 67 people were arrested from Occupy Los Angeles, SEIU and Good Jobs LA which combined forces for two back-to-back protests, both of which had as there centerpieces acts of civil disobedience that brought important sections of downtown to a complete standstill as the biggest occupation in the nation took to the streets. The first was a march that started at 7:00am to the 4th St. bridge, that brought Figueroa Ave, which at 30 miles, is the longest street in LA, to a complete standstill in the middle of the morning rush hour. This also pretty much shutdown freeway access to downtown, Figueroa is that important. 23 protesters, mostly SEIU members, were arrested in a very orderly, non-violent fashion after the protesters set up tents in the street. I arrived at the first protest near its end. I knew better than to try to approach via the freeways but even surface streets came to a standstill once I got to Figueroa so I settled for a parking lot on 8th, west of Figueroa. Knowing that I might be arrested, I picked a lot that never closed and walked into the action between 3rd and 4th. From there I returned with the occupiers to city hall. The next march was to start from there at noon. This day's activities had been carefully planned for weeks. We intended make a major expansion and create a new occupation at the Bank of America Plaza on Flower between 3rd and 4th. It became clear that the protest we did several weeks ago in which we set up tents in the Hope St. Bank of America lobby was a dry run for this. The whole afternoon had been planned as a beehive of protest activity in downtown Los Angeles with three marches by different groups headed for different locations in the financial district. Few people knew the final objective before that morning and that was obscured by all the published activity. The LAPD had sensed the wind and knew that an expansion or move was planned, but they didn't know where. This left them trying to protect every open space. 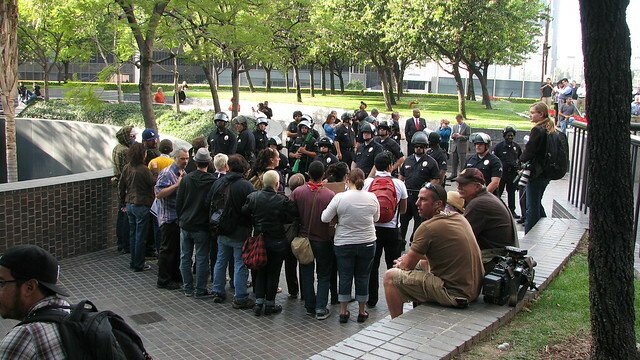 On our way back to Occupy LA, some of us noticed that the cops had closed the nearby dog park with yellow tape and a detail was guarding it. We laughed. We asked them "What are the dogs going to do?" and "Do you really think we're going to occupy a dog park?" When the marches diverted from their published paths to converge on the Bank of America Plaza, the one with the orange Picasso, I couldn't believe it. 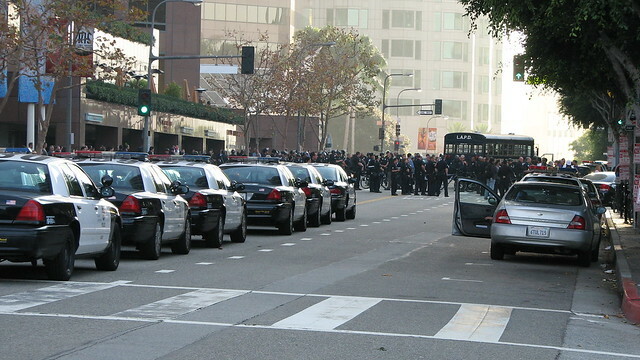 It had been left virtually unguarded with only a few rent-a-cops and LAPD as we took the plaza. 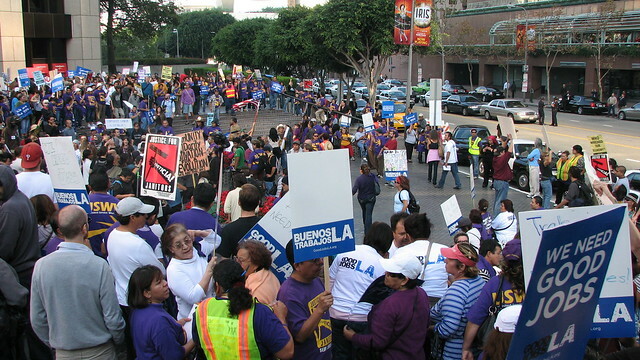 While SEIU members flooded the streets and marched around the plaza, a group of occupiers took the high grassy ground in the center. A couple of cadre emerge from their hiding place with pre-positioned tents and supplies, and in a matter of minutes, before the LAPD showed up in large numbers, we had more than a dozen tents up and encircled by more than a hundred activists from Occupy LA, and outside of that, around the orange Picasso sculpture and other section of the Plaza were hundreds more activists and supporters. 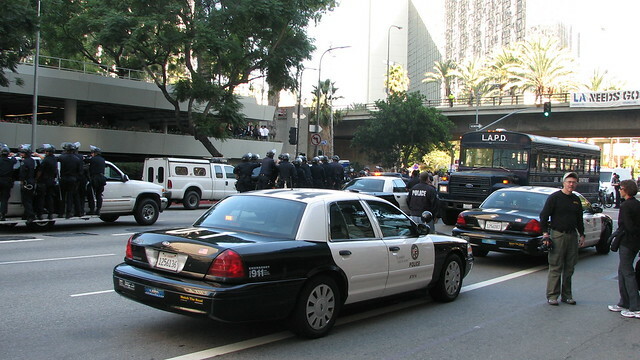 For the afternoon rush hour, it was the LAPD's turn to block the streets as they turned Hope St., in front of the Plaza, into a parking lot for police cars and a space to form up squads in riot gear. The standoff began. It was a little after 2:00pm. Most of the union members were starting to leave but other activists were coming to support this new occupation as cell phones sent the message back to base camp at city hall and throughout the region. The media team built a mobile rig for this and I'm told that more than 10,000 people ended up watching the unfolding events on the Internet LiveStream. There was also a lot of other media of all types. The local TV news, knew it was going to be a big day and so they were covering the unfolding Occupy LA events starting live with the 6am morning news. 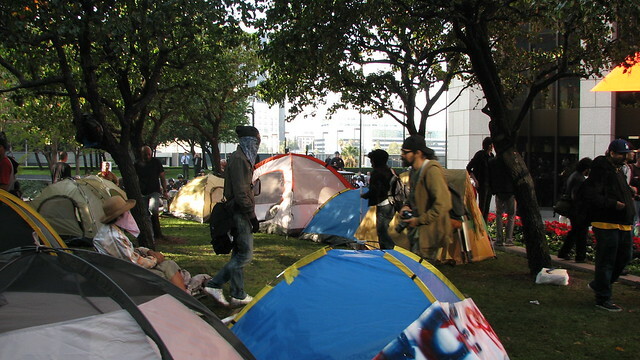 While the LAPD moved to encircle the occupiers with the tents in the center grass covered square, the first move was made by the B of A management. They turned on the sprinklers! As if. As if activists that were willing to face off with cops in riot gear armed with guns that shot a 37mm Foam Baton Round were going to be run off by a little water! 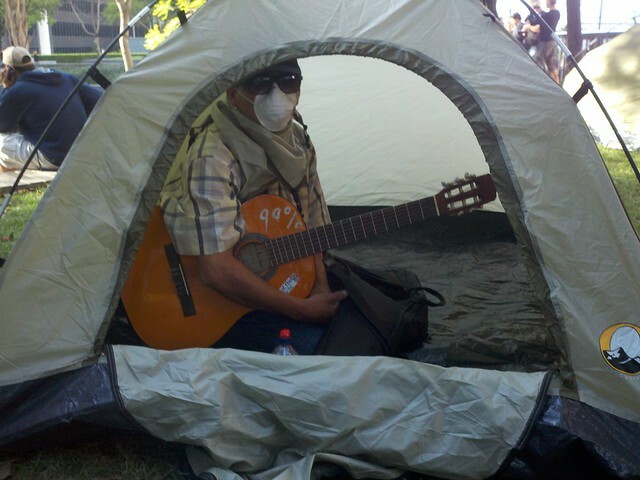 One innovative occupier came up with the solution. We used the tent pole bags to cover the pop-up sprinklers. This still left a lawn that soon became a muddy mess and because of B of A's little stunt, more damage has done to sections of their lawn in hours than had been done to the lawn at city all in as many weeks. Eventually we did find the sprinkler water valves in the Plaza and shut them down completely. 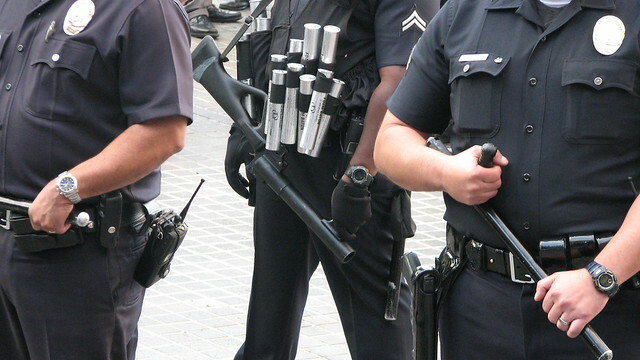 The LAPD, however, was a different matter. They kept building their forces. My favorite question for them was a quote from the Usual Suspects, "Sure you brought enough guys?" It was interesting to find that because of the city budget crisis, they weren't paid overtime for the extra duty. This was also true in the jail and it became one of our best talking points with them. It wasn't all conversation but the standoff lasted for hours. We knew that a lot of pressure was being placed on Mayor Villaraigosa to leave us be. Union leaders, community leaders and others were keeping his private lines lit up. Meanwhile, on the Plaza, a group of religious leaders, Christian, Muslim and Jewish joined us for moral support. However, they did not stay to get arrested. Eventually it was the Plaza's owner that forced the police to act. The Bank of America Plaza is owned by the same people that own Zucotti Park were Occupy Wall St. is. That was one of the main reasons for choosing that target, as a show of solidarity with Occupy Wall St.
At 3:55 the LAPD brass with bull horns announced that we had 5 minutes to take down our tents and vacate the premises. Seeing little compliance, they gave us an automatic extension to 4:10 pm. That time came and went. By then we had reformed our lines as locked arms encircled around a few of the tents. For the next hour that was the standoff. They even took to loading there riot guns in an effort to intimidate us. In anticipation of a tear gas attack, we distributed face masks and vinegar for soaking bandannas in. They were hoping that the number willing to face arrest would dwindle and for a while it did. Then it stabilized. We still had about 50 people that weren't going anywhere, so around 5pm they moved forward and arrested us one by one. We were locked arms in a tight circle as the cops in riot gear closed in. The commander suggested that things would go better if we just sat down while still locked arms. We considered our options then and there and decided to remain standing. When the commander asked what was going on. Someone explained to him that we were a democratic assembly and we always made decisions democratically. I then asked if someone wanted to take stack. When they arrested us they used the tie wrap handcuffs and of course they put them on way too tight. One occupier was sitting next to me for hours and his cuffs were on so tight that he couldn't move the fingers of this left hand and it was getting cold. After a bit of agitation by us, he got some relief. Another, at 80, the oldest of the "custodies" came away from the experience with bloody wrists. My Prisoner's Receipt says that it was a citizens arrest for trespass by one Dave Thompson, citizen. Bail $100. That's the way it was for all of the 42?? occupiers that were arrested and taken to booking in two vans and a bus, a second wave followed later. The booking process was a very slow one that involved an occasional action with a lot of sitting around in hand cuffs. I told them I had hypertension and they sent me to the MT. Another delay. He took my blood pressure. I told them I had a two day supply of medication in my wallet but they threw it away anyway. Finally we were put in a pod with cots, it must have been around midnight. At 3am they woke us for breakfast. I've had better. There were about a 18 occupiers in my pod. My name was called with two others about 4:30 am and a little while after that we were walking out of jail and into the cool morning air to be greeted by a group of occupier with hot coffee. Most of them had just been bailed out themselves. Then I found out about the furious effort that had been going on to raise the money to bail people out. As of this hour, four people remain to be bailed out. One has a high bail because she is charged with assaulting an officer, one has +$500 in tickets and two are refusing to identify themselves. Go figure. I dodge another bullet by getting back to my car slightly before 6am. It had a note on the windshield saying they were going to tow it and the small print at the bottom of the stub gave them the right to do it at the owners expense if it was parked overnight. "Occupy L.A. has taken that message to the doorstep of one of the nation's biggest banks, Bank of America, with a new occupation in front of the Bank of America building in downtown Los Angeles. 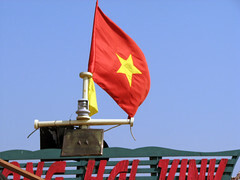 We stand in solidarity with them." 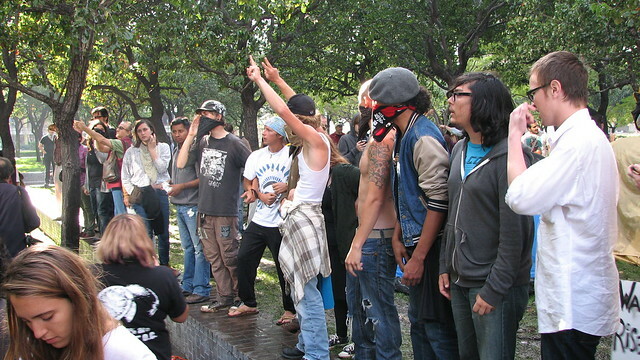 The day's activities were among the boldest yet taken by Occupy Los Angeles. Although we were unable to defend and maintain this new occupation, it served as a warning shot that we will be expanding beyond city hall and sprouting new occupations across the city. It also served to shift our focus away from the internal dynamics that have been eating away at the movement and back to the struggle against finance capital. Most importantly, a lot of unity was forged in the course of these events and a lot of productive discussions took place. Hell, we were even planning to hold a General Assembly in jail a little latter that morning. Maybe that's why they finally sprung us.